WE still aren't clear what year it is. It might 1996 when the twins were 2...not 3. Duh. Now my secret is out....I don't really know what year my kids were born. I have some trouble with that because...well, see this post if you really want to know. Or if you can't remember like me. Or it might just be 1997. And we had moved to town already. It is more likely that it is 1997 and the twins are 3. That's what we're goin' with. So there is no real excuse for our lovelymismatched clothing choices. Anyway, it seems as though Frick was about to launch himself somewhere. Notice the death grip I have on his arm. Frack seems like she was trying to become one with me--again. 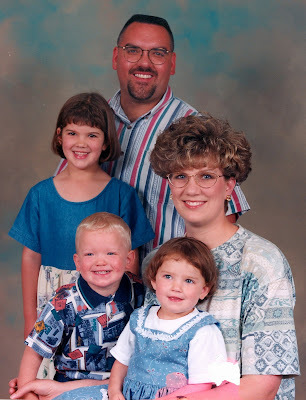 Family pics just aren't something that we have ever done well. My girls just stare at the photographer like he has grown antlers and my son smiles like a million dollars is at stake. Mr. Wonderful's eyes disappear when he smiles and my hair...is always...well, wonderful at the time and hilarious years later. That's ok. Because 30 years from now when we celebrate our 50th wedding anniversary--we'll have some great laughs with our people.